Just How Hard is it to be Inclusive? Many years ago, when I was in College I had a classmate whom I admired very much. And not in a romantic way at all. He was the first person I had met who was so comfortable in his own skin and identity. On our first day of class, fresh out of high school for him (I of course was *so* mature having been in university prior to this), he showed up with purple hair, beaded necklaces and a shirt that loudly spelled it out for anyone who didn’t get it: “FAG”. This was in the mid-90’s and up to that point I had not seen much acceptance at the high school level. He clearly had had lots of it, and wasn’t going to back down for anyone. Why do I bring this up now? Because not everyone accepted him for his differences. In fact we were in the same building as the Law and Security Program which unfortunately lived up to it’s stereotype with a lot of bullying jocks in it. They used to make comments to him and push him around in the halls. One day, he’d had enough and he followed them into their class, stood at the front until he had their attention and then dared them to beat him up right there in the classroom in front of their peers. Of course no one took him up on it. But they also left him alone after that. I’ve always admired that about him. I only wish I’d been there that day to see what he did and to support him while he did it. Recently, a video has gone viral of another boy attempting to do the same thing. I don’t know what’s more sad about this video a) that the kids were laughing at him or b) that he even had to do this in the first place. Why in 2014 are we still encountering this kind of despicable behaviour? 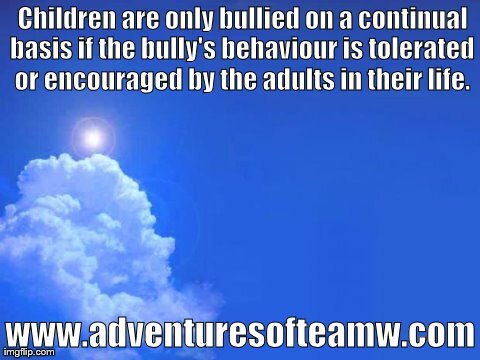 Children are only bullied on a continual basis if the bully’s behaviour is tolerated or encouraged by the adults in their life. When teachers and parents create an environment where ostracizing another student is not acceptable behaviour, then it simply won’t happen. When a blind eye is turned to it we run into situations where children are committing suicide rather than be bullied for another day. Growing up, we had developmentally challenged children integrated into our gym, art and music classes and they often accompanied us on field trips as well. It was a part of the school experience and we were expected to participate. There was no other option. Never were these children treated as lesser than. I remember bumping into one girl several years later in high school and sitting with her at lunch chatting about her favorite boy band. I often wonder where she is now. That was in the 70’s and 80’s, so why is it still so hard? Yet inclusion does happen. While searching links for this post I found this lovely article out of Alberta and in talking to a couple of moms with children with special needs, I heard of a similar story where a way was found to include a wheelchair-bound student. I wonder then, has inclusion become automatic for physical challenges such as wheelchairs, while neurological differences such as Autism are still in the dark ages for systemic inclusion? Why do we not yet have a system in place that demands inclusion for all children, one that does not tolerate exclusionary or ostracizing behaviour from students, teachers, and other parents? It wouldn’t have to be an iron-clad set of rules, but rather needs to be a culture and environment carefully nurtured and developed by those in charge. This entry was posted in asperger's, autism, bullying, inclusivity, School Support, special needs, teachers and tagged autism, bully, bullying, children, exclusion, inclusion, neurological differences, ostracize, school, special needs, support, teachers on May 23, 2014 by TeamWmom.